The Unión Cívica Democrática (UCD), a coalition of Honduran civic groups formed to defend democracy in Honduras, issued a statement (in Spanish) in support of the independence of Honduras' Supreme Court. UCD also sent the following English translation of the statement to the US Supreme Court and are "calling on all Supreme Courts and Judges’ Associations in the world that they be informed of these acts geared to interfere and force our Supreme Court to revoke legal decisions, destroy the judicial career and establish destructive precedents for our Legal System." The statement indicates that UCD is aware of external and internal pressures against the court, and even more surprisingly, that an attempt is being made to hold a meeting without the attendance of certain judges, a la Daniel Ortega in Nicaragua. UCD also demands that the investigative report be made public and translated for the international community so that everyone will know the true reasons that these judges were dismissed. We have been informed that a plenary meeting of the Supreme Court has been called for Monday, May 31st. The meeting’s purpose is to deal with issues of the utmost importance relating to our democracy, the respect for the rule of law, the strength of our institutions and the peace and stability of Honduras. These issues are: the re-installment of the judges that were dismissed following due process and the treatment that will be accorded to Manuel Zelaya in case he decides to return to Honduras. As representatives of Civil Society, we know about and reject internal and external pressures that are being brought on the Judicial Branch in order to revert the judges dismissal, despite that it was taken according to the Constitution, the Law that Organizes and Oversees the Courts, the Law that determines the Judiciary Career and the Code of Ethics for Judicial officers and employees. We reject the intention to change the day of the plenary meeting in order to take advantage of the absence of Lead Magistrates that are opposed to the restitution of said judges and demand that all decisions relating to the dismissal of judges for inappropriate behavior be taken only by Lead Magistrates and not by substitutes. We express our continued solidarity with the Honduran Supreme Court that has stood firmly and with dignity against foreign pressures that have tried to destroy our democratic system. 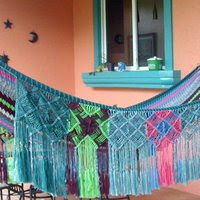 If the international recognition of our country and our reincorporation into the OAS depend on destroying our democratic institutions, weakening the Judiciary Branch, attacking the Attorney General’s office, discrediting our Human Rights Commissioner (Ombudsman) and our police and Armed Forces, we reject wholeheartedly bending to these foreign interests that seek to destroy the Honduran family. We stand in defense of the decision taken by the Supreme Justices which others seek to revoke and destroy the independence of the Branches of power and demand that the Supreme Court make public the report of the Inspector General of the Judicial Branch that served as the legal basis for the Judges’ dismissal. We will translate it and make it known to the world so that everyone can see the true reasons why these judges were dismissed. We are calling on all Supreme Courts and Judges’ Associations in the world that they be informed of these acts geared to interfere and force our Supreme Court to revoke legal decisions, destroy the judicial career and establish destructive precedents for our Legal System. Likewise, it is our belief that as a Honduran, ex President Zelaya is free to return to our country at any time as a normal, law abiding citizen. As such, he cannot be bestowed with any special privileges or special treatments that are not contemplated in the law and thus, must follow due process and respond to the legal charges set against him. No one is above the law. We hereby confirm our permanent support to the Supreme Court and alert the Honduran people of these attempts to diminish the independence of the courts and manipulate, for political purposes, the courts’ actions. Unión Cívica Democrática (UCD) is a coalition representing a great majority of organizations, groups and associations of the Honduran Civil Society. In the name of the Civil Society, the UCD is the guardian of democracy and performs its permanent role of surveillance over the political, economic and social development of Honduras. UCD is inviting everyone to join with them to confront the enemies of deocracy that each day are getting stronger. "We can't lose time. Act now." said their recent email. Please visit the UCD website to join. Honduras can't catch a break! We've gone directly from extreme drought conditions in the southern part of the country and water rationing in Tegucigalpa to full-fledged flooding from Tropical Storm Agatha. Mudslides are likely due to the extreme deforestation in many areas. 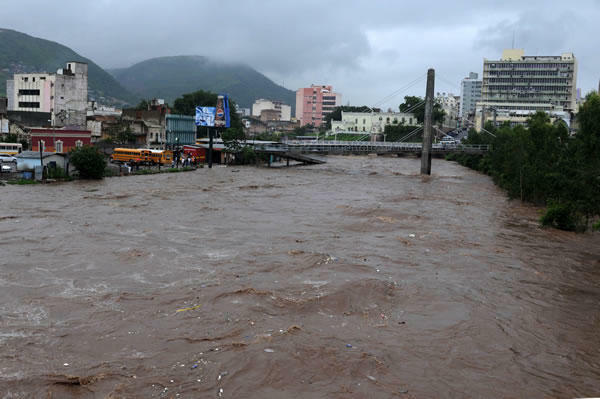 Several rivers have overflowed their banks, including the Rio Choluteca, upon which at least one bridge has been lost. For a time today, all the airports were closed due to visibility problems. Channel 10 has had weather/news coverage all afternoon and the videos show that conditions are pretty serious. Right now I'm watching a river bank cave in. Some rivers have reached the height of the bridges and this will only get worse as the mountains shed the excess water into the rivers. Here in La Ceiba, things are not bad. We had an inch of rain two nights ago and another inch yesterday, but only some scattered sprinkles today. Generally, May is one of the driest months in La Ceiba. 1. I am against illegal immigration in any country. Period. But that doesn't mean that I don't have empathy for those who feel it is their only hope or for US Americans who families are torn apart because of immigration laws. 2. Illegal Immigrants: There are many more illegal gringos in Honduras than most of you realize. They are illegal here for most of the same reasons (I don't qualify, it costs too much, it's too complicated, I won't be here that long, I didn't know the rules!, and so forth.) I have empathy for some of them, too. 3. US Tax Law: Don't know why anyone would assume that British and US tax laws would be the same. US Americans pay income tax and continue to pay property taxes on their US properties regardless of where in the world they live. So I have paid hospital tax for hospitals that I don't use, school taxes for schools that I don't use, junior college taxes for colleges that I don't use, city and county taxes for roads and services that I don't use, as well as income tax. I made that comment about taxpayers for all the people who use taxes as justification for their outrage and/or racism. Most of the taxes that I pay are going to support white and black people as well as rich white bankers, stock brokers, and politicians, not brown people, since so many people think it is important to make that distinction. Everyone pays unjust taxes. Anyone looking for fairness and an equal share of their tax dollar needs to look for another country and I don't have any idea where that would be! 4. 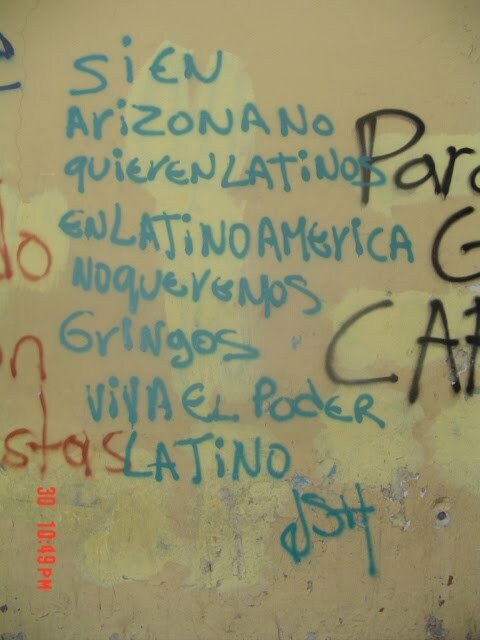 Racism: There is no other word for anyone who assumes that all Latinos are lazy criminals out to destroy the US. 5. Right/left; Conservative/Liberal; Democrat/Republican; Nacionalista/Liberal (Honduras); Blue/Red (Honduran or US): As completely impossible as this seems to be to believe, I don't make any of my decisions on whether an issue is R/L, C/L, D/R, N/L, B/R. So those who love my opinion one week, may not the next. So be it. "I never submitted the whole system of my opinions to the creed of any party of men whatever in religion, in philosophy, in politics, or in anything else where I was capable of thinking for myself. Such an addiction is the last degradation of a free and moral agent." But the main point for posting that photo was completely missed by most readers. That is: Everything the US does has broad reaching effects, including on American citizens living or traveling everywhere else in the world. I know that we are a small, unimportant minority, not much appreciated by the US to whom we pay taxes or by the countries in which we live to whom we also pay taxes. There is no reason that we should be. I'm not asking for sympathy, just asking you to think outside of your own little world. 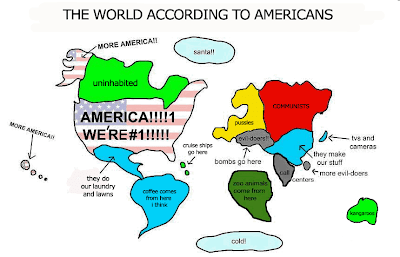 If you are wondering why there is so much anger against the US, why there are so many terrorist attacks and attempts, I would suggest that you delve a little deeper into what the US has done and continues to do in other countries. And by that I mean, don't only rely on what you read in the mainstream US media, because, as many of us have discovered from personal experience, it is NOT reliable news and it often bears no relation at all to actual facts. For example, how many US Americans know that after two years of harsh "economic strangulation" didn't get results, the US invaded Panamá in 1989, complete with air strikes dropping over 400 bombs, resulting in as many as 4,000 deaths and 20,000 displaced Panamanians in a violation of international law condemned by the UN? Why? − to remove the very same 'dictator' that the US had been supporting years earlier. (Sound familiar? How many times has the US backed the wrong guy?) Read more from their independent truth commission, including claims that the US media was used first to "psychologically prepare" the US public for the invasion and then to cover it up afterward. 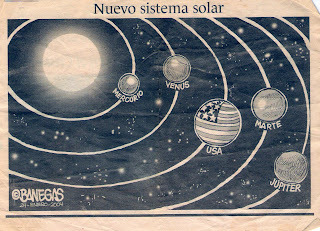 If you are of the common belief that the universe revolves around the US, you may not even be aware of this brewing anger. I suggest that you should be. It isn't only 'crazies' who have a grudge against the US, and more and more, that anger and hate seems to be within the US as well. Pretty scary. And again, for anyone who didn't get it the first 10 times I've said it: I am against illegal immigration in any country. I believe that every country has the right to set the immigration laws that they want to set and that they will reap the benefits or suffer the consequences, depending upon how wise those laws are and how effectively they are enforced. 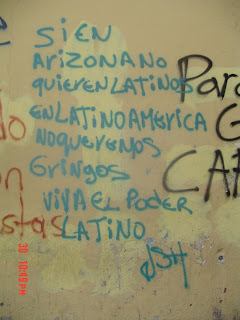 in Latin America, we don't want gringos. who, incidentally, get nothing for their US tax dollar.